In the present times, credit cards have become an easy solution. You can just grab your cards and go for shopping, dine out, go for a holiday, buy an big-ticket item, and what not. Only what you need is the required credit limit. Many of us have also started relying on credit cards for emergency fund. But, there are certain risks associated with it. Not always it’s a good idea. If you do so, you should be aware of the risks associated and how to avoid them. About 26% people in our nation do not have any emergency fund. Only about 40% of families have savings worth of meeting 3 months’ daily necessities. So, what will you do? Will you consider credit cards for emergency situations or try to build a fund for emergency purposes? Where will you place yourself financially? Needs vary. You have to decide how much you need to have in your emergency fund. To assess this, consider the stability of your job, your assets - home, vehicle, etc., your health condition and your expenditure in comparison to your income. The more riskier your situation, the larger amount you need to have as your emergency fund. So, think - if you rely on credit cards for emergency situations, check out - do you have enough credit limit? Moreover, it’ll be difficult to repay the amount. We’ll discuss this in the next point. First of all understand that by deciding to use credit cards as emergency fund you’re taking a big risk. You never know how big the expense will be such that you have enough credit limit. Now comes the interest rate. Even if you have the credit limit, will you be able to repay the balance before the interest starts accruing on the unpaid balance? Moreover, check out the rate on interest on your card(s) on which you have higher limits. So, isn’t it better to create an emergency fund? The question is, when and who can unquestionably rely on credit cards instead of creating an emergency fund? Can it be advantageous in certain situations? There may be 1 advantage of a credit card emergency fund - If you use the cash for a better purpose, which can improve your financial situation. Instead of putting the cash in a savings account on which you may be earning 1% interest, you can use the dollars to repay high interest credit card debt, pay back auto loan, pay off mortgage loan, and so on. And, if you think the interest on savings account is very less, consider the emergency account as the cash portion of your financial portfolio. If you use the cash anywhere else, you may lose the liquidity. As already discussed, there are obviously risks associated with using credit cards for emergency fund. If you don’t pay back the outstanding balance in full within the due date of the monthly cycle, you’ll have to pay interest, however nominal it is. The more the balance, the greater the money you’d have to pay as interest. So, with the increase in the credit limit, there might be a higher chance that you’d pay more interest to the credit card issuer bank. And, if you start rolling your debts from one month to another, you may start facing debt problems and difficulty to repay the debt. Ultimately, your credit issuing bank will decide your credit limit. You have no role in it. It is ultimately their decision how much credit limit you’ll have on your card. Do you think you can bank on your credit limit and it is quite high? If you think so, you’re making a big mistake. 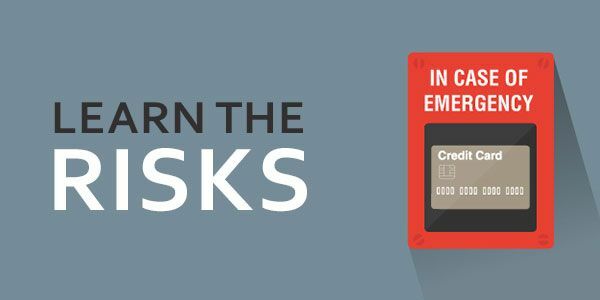 If you lose a job, your credit card issuer can reduce your credit limit. Likewise, if you fall behind on some payments, you may experience a slash in your credit card limit. I think this point requires no explanation. More or less every one of us are aware of the pitfalls of using credit card and not paying back the amount at the end of every billing cycle. Is is actually very easy to incur debt with a relatively higher credit limit. So, if you use your plastic money for emergency situations, it might happen that you charge it for a higher amount, and face difficulty to repay it later. So, it is advisable to avoid being in such a situation. However, if you have already incurred credit card debt, don’t panic. Just look for a suitable way to repay credit card debt. Here are a few tips to avoid the risks associated with using credit cards for emergency purposes. Be a responsible user and you'll find that credit card if your best friend. Make a promise not to carry any balance on your card. Avoid swiping your card for an amount which you don’t have in your checking or savings account. It is better to have a separate credit card for emergency purposes. Do not use it regularly and keep it strictly for emergency use. Open a savings account at your preferable bank and opt for automatic transfer from your any salary account to this new account on a particular date every month. You can even opt for a weekly deposit if that helps you. Do this and relax! You will start building this fund without having to think about it. You have to repay the entire balance on a charge card. So, it forces you to be disciplined. No interest charges are there on that card. To conclude and sum up, an emergency fund seems to be better than relying on credit cards for the purpose. Think once again - If you save about $20 a week and put it into your emergency savings account, you’ll earn about 1% interest on it. Thus, you’ll save about $1,000 plus the interest amount in the savings account in 1 year. Now, you calculate how much it’ll be after, say about, 5 years.... A decent amount to bank upon! What are the collection rules for medical debts?